Okay, I must admit some of my restaurant choices can be on the "touristy" side of things. Hey, nothing really bad about that since some are popular for a reason. However, I try to stay away from actual tourist traps that usually included a gimmick of sorts (ie. a view, location, recognizable name or been on TV). 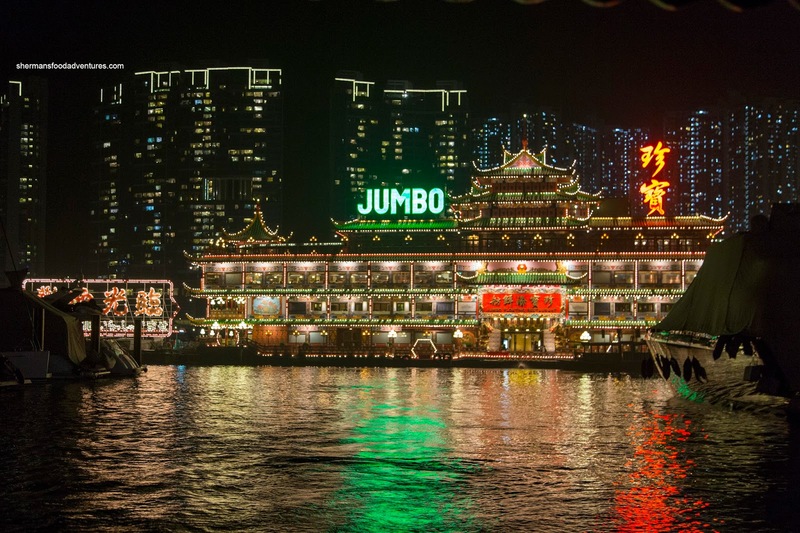 Well, the Jumbo Floating Restaurant satisfies nearly all of those criteria and more. It wasn't my idea as Uncle Willy suggested it (sheepishly), but hey, I was game since I'm no food snob. So we made our way out there after a day at Ocean Park. Arriving at the pier, we took the short tender to the restaurant (part of the experience) along with the predictable tourist groups. 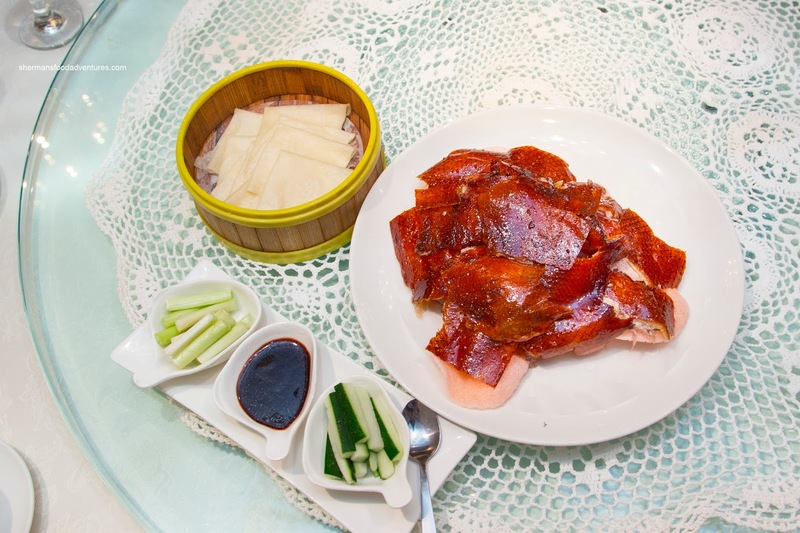 We ordered a la carte starting with the Peking Duck. Carved table side, this was a pretty large duck that yielded plenty of usable skin. It was in a nice lacquered hue and was more or less crispy. However, the layer of fat was noticeable and some of the fattier pieces were not crispy. We found the crepes to be excellent being thin, tender and not dried out. 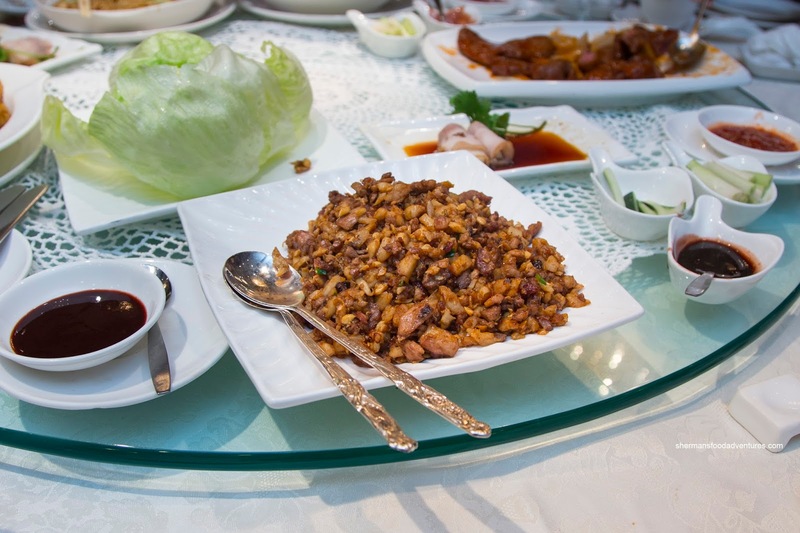 The 2nd course was the usual Duck Lettuce Wrap which was subjected to a good wok fry. Flavours were mild and caramelized, but the duck itself was pretty dry. I enjoyed the Bamboo Pith with egg whites and crab roe as the flavours were sweet, a bit briny and restrained. This was key as this dish was delicate and too much salt would've destroyed it. 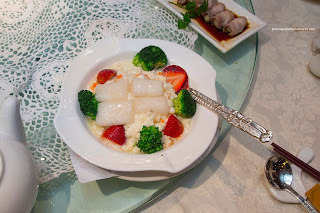 The egg whites were soft and fluffy and the amount of crab and crab roe were impactful. On the other hand, there were far too many crab shells which meant we had to pick them out of our mouths. 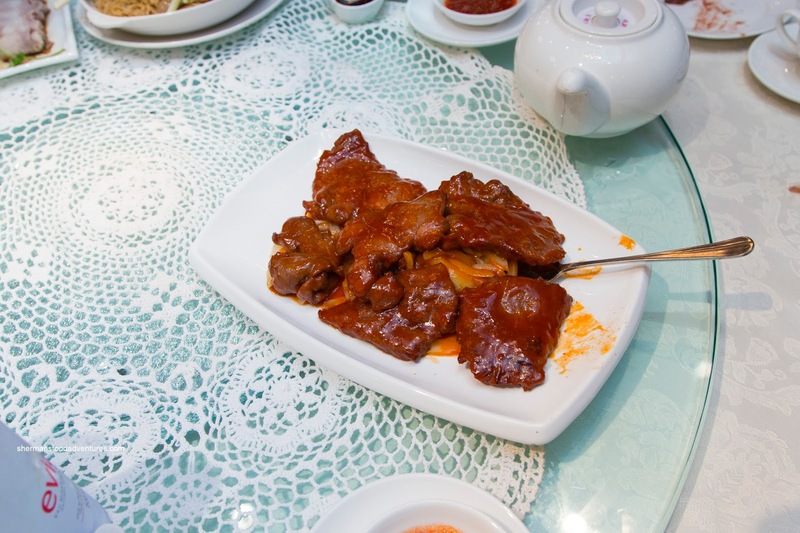 Presented as a large portion, the Chinese-Style Beef Tenderloin was prepared medium-rare to rare. This was okay by me because that meant the beef was moist and fairly tender. There was just enough sauce to coat each piece, but it needed more tang. 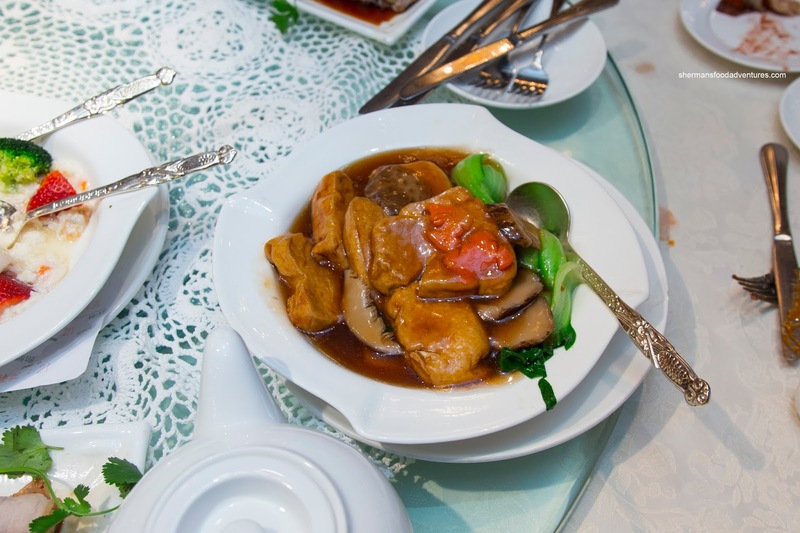 For some strange reason, I liked the Braised Silky Tofu with mushrooms and Shanghai bak choy. 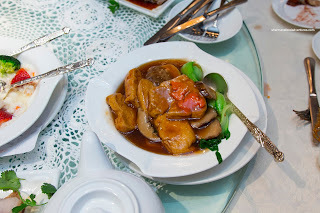 I'm usually quite the meat eater, but the texture of the fried tofu was appealingly meaty and buttery at the same time. The oyster-based sauce was silky and not overly salty. There was a good amount of tender shiitake mushroom as well. As much as the Deep Fried Chili Salt Squid looked super flavourful, in reality it was not. It was crispy though, but in a dry manner (where the batter was a touch mealy). 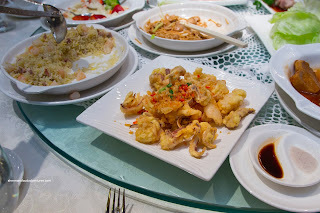 The squid itself was tender and had a nice chewiness though. For the kiddies, we ensured that they were taken care of with the Yeung Chow Fried Rice (without any greens). 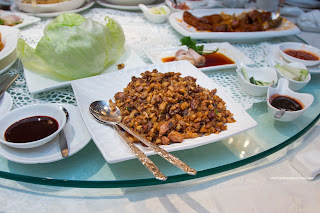 I do enjoy nutty dry rice, but this was taking it a bit too far as it became cumbersome to eat at the end. The rice was just too hard and didn't go down very well. 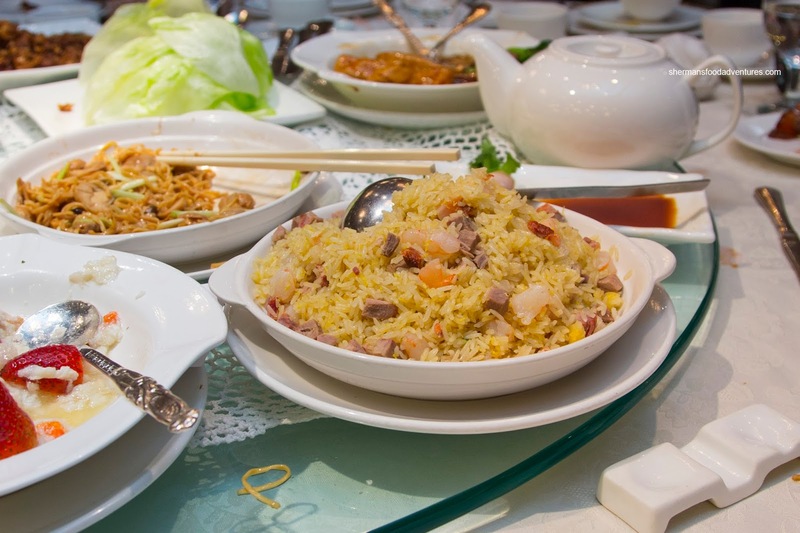 Too bad as the wok fry was good and there was plenty of lean BBQ pork and crystal cold-water shrimp. Lastly, we had the Stir-Fried Yee Mein with flowering chives. This was pretty good with chewy noodles with the bright crunch of the chives. 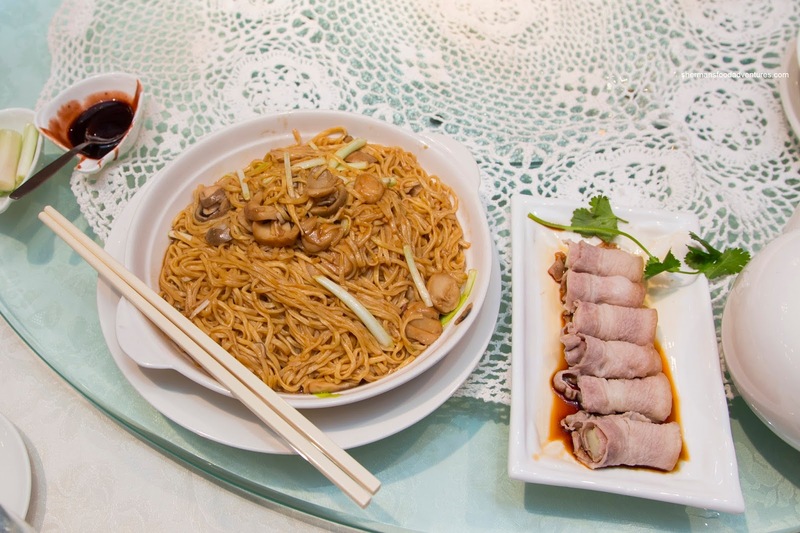 To the right of the noodles in the picture was a plate of sliced pork rolls which were a bit dry, but still soft and tender. 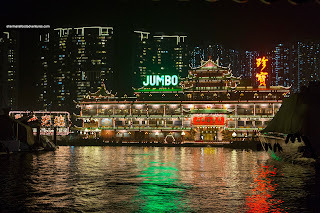 Overall, Jumbo pretty much met expectations - being a touristy, overpriced and average-tasting restaurant. Go there if you must, but not really necessary.